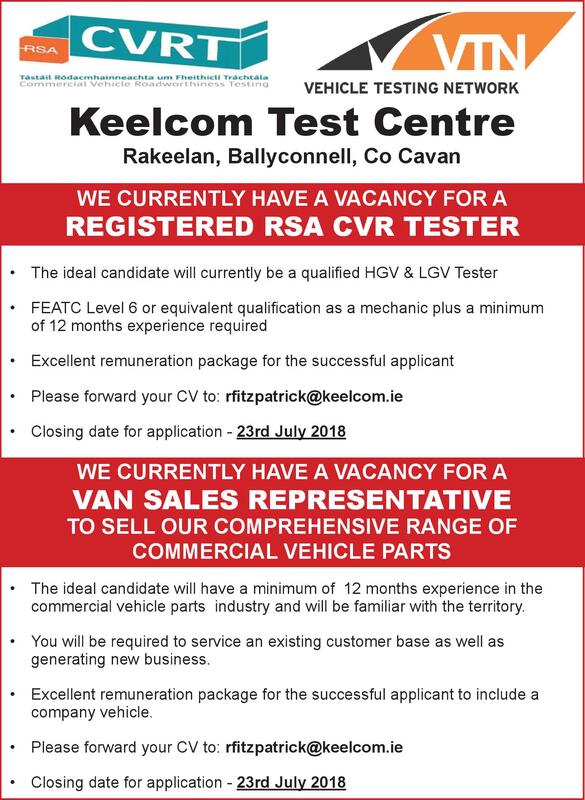 Keelcom Test Centre, Rakeelan, Ballyconnell, Co Cavan have vacancies for a Registered RSA CVR Tester & a Van Sales Representative. Keelcom Test Centre are seeking a Van Sales Representative to sell their comprehensive range of commercial vehicle parts. * The ideal candidate will have a minimum of 12 months experience in the commercial vehicle parts industry and will be familiar with the territory. * You will be required to service an existing customer base as well as generating new business. * Excellent remuneration package for the successful applicant to include a company vehicle.